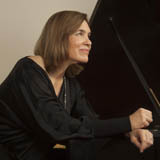 Bargemusic’s weekend begins Friday evening, July 13 at 8:00 with pianist Beth Levin (photo) playing works by Beethoven and Handel. Saturday evening, July 14 there will be two concerts: one at 6:00 featuring works by Bach, Paganini/Enescu, Beethoven, Kreisler, Paganini/Schumann, deFalla/Kreisler, and Paganini; and one at 8:00 featuring works by Bach, Beethoven, Paganini/Enescu, and Sarasate. Both concerts will be performed by Mark Peskanov on violin and by Doris Stevenson on piano. Sunday afternoon’s concert, July 15 at 4:00 PM, presents an interesting instrumental combination: Brandon Patrick George on flute and Mélanie Genin on harp. They will play works by Debussy, Fauré, Saint-Säens, and Cras. There are details for each concert and you may buy tickets here.